Ever dropped a key or coin in the water? If you have, you’ve probably come across magnets as a fishing aid. But there’s more to that idea than just recovering random metallic objects that you’ve carelessly dropped in the stream. Last week, I met with a couple of old friends I hadn’t seen in a while. Now, I’m not used to changing my fishing methods all that much. So, when one of my buddies suggested we go magnet fishing, I was reluctant. After all, we weren’t going to walk away with dinner and a satisfying catch. All I’d heard about magnet fishing was the risks it entails, and they did not make it look very promising. So I decided to research— what, exactly, is magnet fishing? And did I want to do it instead of going for the traditional fishing trip? After trudging through countless websites and talking to several magnet fishing enthusiasts, I decided I would go for it. And, once I had given it a try, I came to a (surely groundbreaking) conclusion— magnet fishing is fun! That’s when I decided I needed to share everything I found out about this hobby with you. No one should miss out on a rewarding, interesting, and wholly different experience. Also, as there are dangers to magnet fishing, no one should try to do it without preparing properly. Without further ado, here’s everything you need to know about magnet fishing! Let’s get it out of the way: magnet fishing (also known as magnetic fishing) is not like regular fishing. The main difference is that there are no fish to be caught: that’s not at all what you’re trying to do here. Instead, magnet fishing consists of searching for metallic objects in wild waterways. So, if you’re trying to find a lost key in the pool, we’re very sorry to disappoint you— that’s not magnet fishing. In this hobby, you’re more like a treasure hunter or metal detectorist than a fisherman or angler. Many people think that the activity first got started when someone was looking for their lost keys. Riveting, right? Good news, though— magnet fishing is much more fun than it sounds. First, unlike regular fishing (in which you are hunting for living creatures that might decide not to take the bait), you’re bound to find something. It will probably not be a secret hoard of eleventh century Anglo Saxon treasure (more like lost machine parts or, yes, keys), but I guarantee, speaking from my own first hand experience, it’ll feel satisfying. What are some examples of the treasures you can find with magnetic fishing? Some of the recorded finds include a wide variety: car parts, coins, safes, bicycles, guns, and even old bombs. It’s no wonder, with such a crazy collection of possible bounty, that many folks have taken up this hobby. There are lots of celebrities, too:: English rugby player James Haskell is a prime example. You will be in good company! What Are the Benefits of Magnet Fishing? We’ve already talked about the rewarding sensation you get when you unearth (un-water?) an unexpected find. It’s like being a child again, playing treasure hunt with your friends. It really is a wonderful feeling— not knowing what’s coming next, going home with interesting objects to collect and display. Maybe you could even stumble upon historical artifacts or, like some hobbyists in Belgium, help the police recover important evidence. Just like regular fishing, you will be exercising patience, strategic thinking, and curiosity. Patience: you will probably not find anything right away, but you just keep at it until you do. Strategic thinking: you will have to practise the exercise of regularly planning your course of action for best results. And, of course, curiosity: the main foundation of magnetic fishing is the wonder that asks, ‘What is hidden under the surface?’. But the benefits aren’t just for you! When you go magnet fishing, you are not just enjoying the great outdoors passively. You are also helping out the environment. Why is that? Essentially, you are making a game out of cleaning human generated trash that has been dumped in natural areas. Everyone loves conservation. Or, you know, they should. So, when you go fishing with a magnet, you become everyone’s hero. But it is not all just fun bits. Despite the many benefits to you and to the environment that magnet fishing has to offer, there are also some quite relevant risks. You should never start a new sport or hobby without figuring out if it safe for you. In the last few years, magnetic fishing has been steadily gaining new fans. And it’s no wonder— with all its benefits and mystery elements, it draws people in. The problem is that many don’t realise that there are risks in the activity and, for that reason, don’t take the necessary precautions. So, what are the dangers of magnet fishing? Let’s take a look at what has happened, what the main risks are, and how you can protect yourself. First, the law: don’t magnet fish anywhere that doesn’t allow it, or that doesn’t allow the more conventional types of fishing. Look out for signs and, if you can’t find any information that way, follow up by asking the local authorities (for example, the police). Also, physics: given you will be fishing with a highly potent magnet (see the following section How to get started), make sure that you are not anywhere near metallic structures or buildings like bridges, piers, or poles. If you do not pay attention to this, you will end up with a magnet attached to the structure, potentially irrecoverable, and possibly even harmful if the action is fast. The same goes for moving metal structures like boats, propellers, and other machines. Keep an eye out! A problem with the magnets used in this kind of fishing is the potential for shattering. This exists because of the structure of the magnet, which is made out of compressed powder. While it is not bound to happen, it is a possibility that’s made worse when you let the magnets slam into objects or each other. 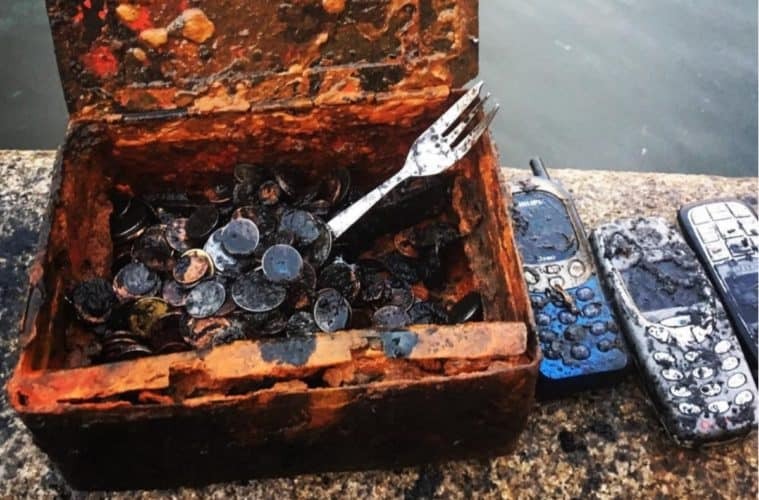 The strong magnets used in magnet fishing also have the ability to damage electronics in their surroundings, so use caution in handling. And finally, there is the much feared and press broadcasted chance of finding something harmful when magnet fishing. That is, essentially, a loaded gun or an undetonated bomb. It’s not likely, but it can happen. To be as safe as possible, inform yourself about your local regulations, follow the law, and use common sense. Not deterred? Great! Despite the existing risks, magnet fishing is truly a fun sport that gets you out, moving, and living in the moment while also helping out mother nature. The next question is— how do you get started? Take a look at this quick guide based on my own experience and research. You are not planning on going out fishing for metallic car parts and forgotten historical artifacts with your regular kitchen magnet, right? This sport needs a specific type of high power magnet called neodymium magnets. What’s the deal with this strange sort of magnet? It’s made of an alloy of the rare earth neodymium, a material called boron, and iron. The combination gives the magnet a permanent effect and makes it incredibly strong. For clarity’s sake— if a limb were trapped between two large neodymium magnets, chances are bones will get broken. Take a look at the numbers: a neodymium magnet that weighs 2 lbs. (just below the one kilogram mark) has a pull force equivalent to 500 lbs. (above the 226 kilograms in the metric system). That’s pretty impressive. So, neodymium. Handle with care. What else is there to know about these magnets? You should get models that are made for your purpose. The key point your new and super powerful magnet should meet is providing a way to attach it to the rope. Think solid countersunk screws that delve into the material safely. When you have these, it is a lot easier to attach an eyebolt that anchors your line. The experts recommend using Loctite, a widely available liquid for thread locking. Using it gives the structure more stability and minimises the chances of coming apart. If your dog likes to pull at the leash when you walk them, you’ll get a strong leash. Right? Well, then it makes sense to get a sturdy, resistant rope to act as a line to your superior neodymium magnet. The best available material you can choose for your magnet fishing line is nylon paracord. Why is that so? Originally used to tie the parts of parachutes, nylon paracord is nothing short of hardy and resilient. Besides being able to take a lot of force when pulled, this sort of rope is made of lots of tiny threads, woven together in a tight braid. This gives it staying power, homogeneity, and smoothness. Overall, nylon paracord meets the demand for elasticity and resilience, as well as strength paired with lightness. Also, it is super responsive: if you hit something in the murky, mysterious, potentially-treasure-ridden waters of your river or canal, you will feel it through the line. Now, let’s take a look at the specifics. Nylon paracord, yes, but how much of it and why? How do you tell what length you need? Simple: you need a cord that is slightly stronger than the pull of your magnet and that is the right length for the depth of your fave waterway. As for strength, check the manufacturer’s specifications. Each paracord is woven from a differing number of core strands that give it different thickness measurements and varying resistance. A good example: if your neodymium magnet for fishing has a pull of 400 lbs., choose a cord that can take at least 450 lbs. As for length, ask yourself— where do you plan to go magnet fishing? If it is shallow water or water near the bank, use a line of about 50 feet (15 meters). If you plan on braving deeper waters or casting far from the bank, go for 100 feet (30 meters). And, if you’ll be casting from a building or bridge, take that height into account. Bring along the right extra gear and supplies. It’s a good idea to include sturdy gloves to prevent injuries, a plastic box to store your finds, and a small brush to clean them up. Just like a conventional fishing trip, you need to take care of your body. Suit up with sunglasses, a hat with a wide brim, and lots of sunscreen! Protect your feet with good fishing gear like gumboots for wading. Mosquitoes don’t care that you’re effectively cleaning their house— they’ll bite you all the same, so don’t forget your repellent. Test some knots before using your equipment. We recommend a resistant, self-tightening knot like the Palomar, or whatever sturdy knot you use for angling. My top-of-the-list places for magnet fishing are historical towns and areas. Think of the possibilities! After reading through this comprehensive guide, you’re ready to give this fun hobby a try. Remember to pick your best gear and supplies carefully, to use these tips to find a place that’s promising, safe and legal, and (most importantly) to have fun. Isn’t that what all kinds of fishing are about? Go get some friends pumped up and give magnet fishing a crack! How to Get Started Magnet FishingMagnet Fishing TipsWhat is Magnet Fishing?